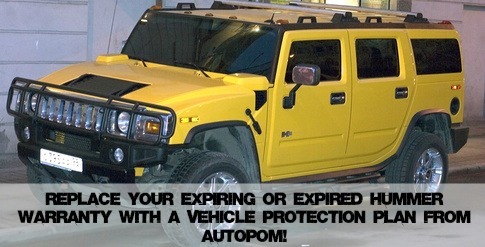 Extended Hummer Warranty or Vehicle Protection Plan- autopom! For die-hard Hummer fans May 24, 2010, was a sad day as the very last Hummer H3 rolled off the assembly line in Shreveport, LA. This followed failed negotiation with a Chinese automaker to acquire the Hummer brand due to lack of approval from Chinese regulators. Hummer owners, of course, were concerned about warranty and service of their vehicles. GM has assured them that as Hummer stores close they will be able to go to Chevy, Buick, GMC, or Cadillac dealerships to service their Hummers. A question yet to be answered is how good the service will be as the Hummer stores are shuttered. Stay tuned. Should you have any questions you can call the Hummer customer assistance center at (800) 732-5493 for more information. Hummer 5-year/100,000 mile transferable Powertrain Warranty with no deductible. Hummer 5-year/100,000 mile 24/7 Roadside Assistance Program. Hummer 5-year/100,000 mile 24/7 Courtesy Transportation Program. This Hummer program provides alternate transportation and/or reimbursement of certain transportation expense if your vehicle requires warranty repairs. You can find complete Hummer extended warranty information at the Hummer website. It is easier than ever to determine how reliable a vehicle is, thanks to the Internet. A simple Google search can yield dozens of pages of information, or you can check one of the many websites that specialize in vehicle information. If you are considering extended protection, get started on your research by checking the reliability record of your vehicle. If your vehicle is known to be quite unreliable, it could make your decision on extended protection easy. Hummer owners will be wise to consider either the factory GM extended car warranty option or a vehicle protection plan from a dependable independent company. In California, this latter option is called a mechanical breakdown insurance (MBI) policy. I would definitely recommend purchasing an extended Hummer warranty or vehicle protection plan before the factory warranty expires. If you wait until the factory warranty expires, it will be more expensive and will substantially limit your options. We recommend that you do some research before making a decision. You can get started on this website. We have a lot of helpful information to guide you in your search for a good coverage plan for your vehicle. You can also call us (800) 724-8141 if you have any questions or request a free, no-hassle quote.